We are spending Thanksgiving this year at my parent's house and although my mother and father will be going back to basics (why mess with what is already good?) with the bird and all the trimmings, I make sure to make the whole nine yards just for leftovers when we get home for that late night turkey sandwich plate:) I have shared appetizers, side dishes, breads, and dessert (all can be found on my recipe link at the top of the page), so now I would like to share with you our menu with any links to previous recipes and the recipe for the main event-- the TURKEY! Now that I have you all good and hungry, it is time to get down to Tom, (Turkey that is). This is hands down my favorite way to cook a turkey. I use two methods to achieve the juiciest and best tasting turkey meat. It also helps that I buy, in my opinion, the best bird. I can't recommend enough the poultry products from Bell & Evans. They are air chilled, antibiotic free, and organic with deep poultry flavor. Yes, you will pay more, but the end result is worth it. 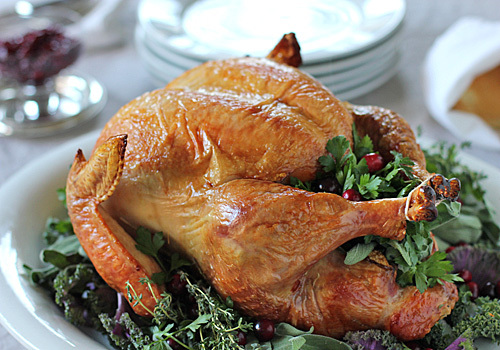 If Bell & Evans' products are not available to you, then find the freshest turkey in your area. Steer clear of the frozen ones that have been injected with some sort of solution and extra fats. They have too much white meat and too little flavor. Now that I have given you some fundamentals for turkey purchasing, on to the method. As I stated, I use two methods. One is a dry brine and the other is a high heat roast. I'll start with the dry brine. Dry brining (rubbing kosher salt between the meat and the skin) balances the moisture in the bird and pulls the seasoning deep into the meat, not just on top of the skin. I have used a wet brine before, but I feel that the dry brine leaves a better texture meat (firm, not mushy) that is still flavorful and very moist. 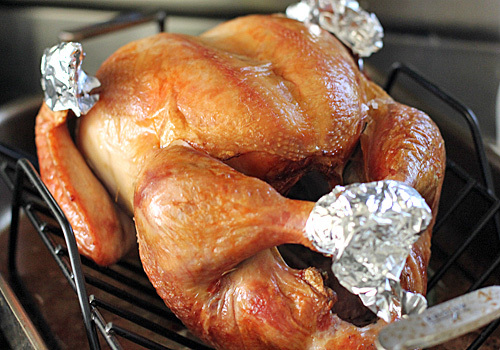 The high heat method is an easier and quicker way to roast a bird; no turing and no basting. I can roast a 12-13 pound turkey in 1 1/2 hours! For more on this method, you can find some good reading here, or check out the cookbook Roasting by Barbara Kafka. Since you are roasting a turkey at 500º F, make sure your oven is clean. A dirty oven means a lot of smoke, so turn the vents on. To help you with the process, I have included a few step-by-steps below. First, choose a 12-15 pound fresh turkey. Remove and reserve the giblets and neck for gravy, if making. Trim any excess fat from the cavity. a chopstick can also help you get started. Just make sure to press against the meat and not into the skin. You do NOT want to break the skin. Doing so will expose the meat to the high cooking temperature, which will result in dry meat. Go on, get your hand in there; nothing to be afraid of. 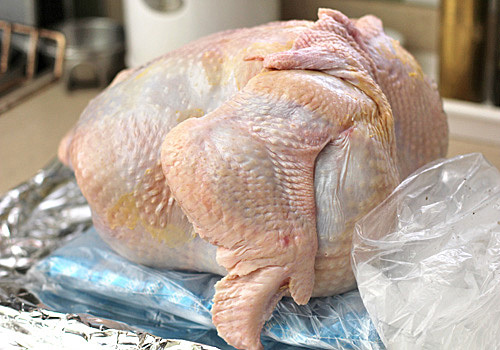 Wrap the turkey tightly in plastic wrap, place on a baking sheet, and refrigerate for 24-48 hours. 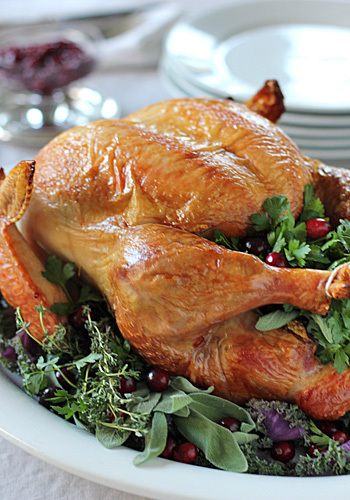 Remove the turkey from the refrigerator, unwrap, and thoroughly rinse of excess salt. Gently run water in between the skin and meat several times to rinse the salt. You don't want a salty bird or salty pan drippings. 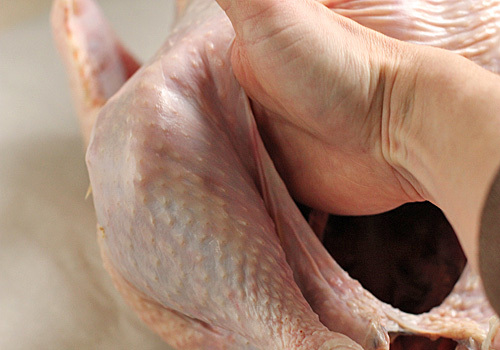 Drain and completely dry the turkey inside and out with paper towels. A dry skin will make for a crisp skin. Wet skin will simply steam. Line a baking sheet with aluminum foil and place an ice bag or freezer pack on top. Place the turkey breast side down on the ice. 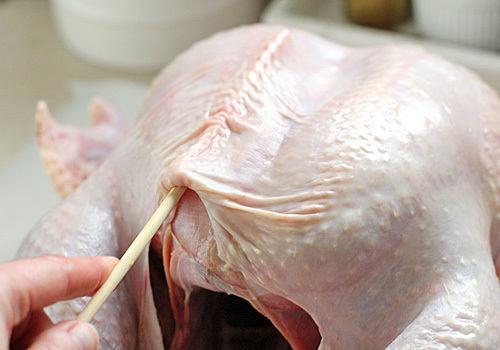 Place another bag on the neck of the turkey, making sure that the ice is not touching any of the dark meat. Since white meat cooks faster than dark meat, this method ensures that the dark meat is is cooked thoroughly without the breast meat being overdone and dried out. Meanwhile, adjust an oven rack to the lowest position and preheat the oven to 500º F (yes, that high). Place a V-rack in a large, heavy-duty roasting pan. Place the turkey in the V-rack breast side up. Cover the tips of the wings and legs with small sheets of aluminum foil to prevent burning. Roast the turkey until the thickest part of the thigh reaches 165º F (the temperature will continue to rise while resting). Check the turkey after 30 minutes. If the breast seems to be browning too quickly, lay a sheet of aluminum foil on top of the breast. Remove the foil 30 minutes before the turkey is done. A 12-pound bird will take about 1 hour 20 minutes. A 15-pound bird will roast up to 2 hours. Carefully drain the juices from the cavity of the bird into the roasting pan. Reserve the juices for gravy and drizzling over unbaked dressing. (I yield almost 1 cup of juices and about 1/4 cup fat from a 12 1/2-pound turkey). Transfer the turkey to a cutting board; lightly tent with aluminum foil and rest for at least 20-30 minutes before carving. I almost forgot-- here is a great kitchen tip for reheating Thanksgiving leftovers (without the microwave). *Note-- the measurements of salt are different for each brand listed. Morton's salt is denser that Diamond Crystal, so less is needed. Any other kosher salt is not recommended. 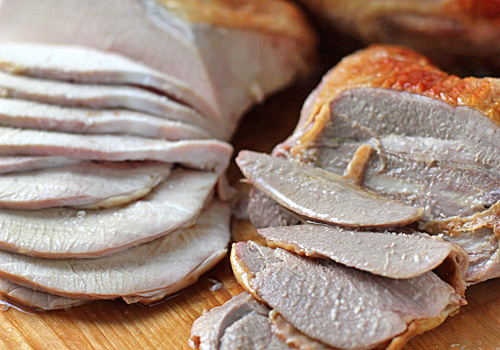 Trim the cavity of the turkey of excess fat. Carefully separate the turkey skin from the meat on the breast, legs, and thighs without breaking the skin. Sprinkle 4 1/2 teaspoons (Morton's) or 2 tablespoons (Diamond Crystal) salt inside the cavity. Rub 2 1/4 teaspoons salt (Morton's) or 1 tablespoon salt (Diamond Crystal) under the skin of each breast. Rub 1 teaspoon salt (Morton's) or 1 1/2 teaspoon salt (Diamond Crystal) under the skin of each leg. 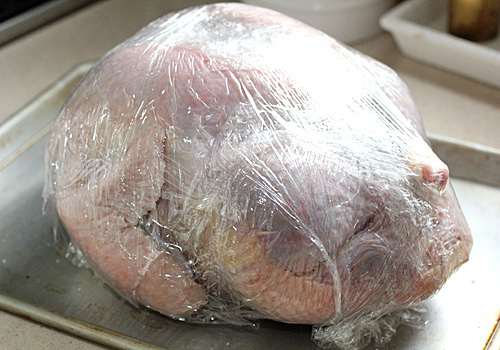 Wrap the turkey tightly with plastic wrap and refrigerate for 24-48 hours. Remove the turkey from the refrigerator. Unwrap and thoroughly rinse off excess salt between the meat, skin, and cavity. Pat dry completely with paper towels. Place 1 bag of ice or freeze pack on a baking sheet lined with foil. Place the turkey breast side down on top of the ice. Place the other bag in the neck cavity, making sure the ice only touches the breasts and not the thigh. (Since the breast meat cooks faster than the white, icing the white meat ensures that the dark meat will be cooked through without the white meat being overdone). Allow the turkey to rest on the ice for 60-90 minutes. Meanwhile, adjust the rack to the lowest position and preheat the oven to 500º F. Place a wire V-rack inside a large heavy duty roasting pan. Place the turkey (breast side up) on the V-rack. Loosely tie the legs together with a piece of kitchen twine and cover the tops of the wings and legs with a small piece of aluminum foil to prevent burning. Roast the turkey until the thickest part of the thigh reaches 165º F on an instant read thermometer (the temperature will rise another 10 degrees while resting), about 1 hour 20 minutes for a 12-pound turkey and up to 2 hours for a 15-pound turkey. After 30 minutes, check to see if the breast is browning too quickly. If so, lay a large sheet of aluminum foil over the breast (do not wrap, just place). Remove the foil about 30 minutes before the bird is done. Carefully drain any juices from the bird into the roasting pan; reserve the pan juices for gravy if using, and place the turkey onto a cutting board. Cover the turkey lightly with aluminum foil and let rest for 20-30 minutes before carving. Enjoy! I love your blog! ALL of the recipes look delicious! I couldn't agree with you more about the Bell & Evans turkey! If you start with quality you're half way there! I love to see the various menus and traditions for the holidays. Thanks for the great post! Thank you and you are welcome! Not only is it fun to share, but I love looking back on my menus. Each one has its own memory. Have a wonderful Thanksgiving! Thanks so much for the step-by-step photos.... definitely helps for when I'll make my first turkey one day. I seriously want everything on your menu. Would love to see posts for the dressing, sweet potatoes, gravy, green beans, braised onions, and truffles. You are welcome:) Sometimes it helps to have a visual. Unfortunately, I won't be able to get to all dishes on the menu this year, but I may have one or two more in the works for next week. Happy Thanksgiving! What a wonderful tutorial! Turkey is not one of my fortes so I really appreciate this! And I love that it roasts so......... fast and turns out so.......... beautiful! Thanks Nicole! wish I could be a little mouse under your table - the whole meal sounds incredible. We are thankful for you, Nicole, a beautiful, loving and talented daughter. We appreciate all of the memories of the past that you are recording for our family and love the new adventures in cooking that are creating so many new memories. See you Thursday. Happy Thanksgiving. I love the idea of the frezzer/ice bags to control the cooking doneness of the white meat versus dark. What type of bags are you using and how long are they kept on the turkey? As written in the recipe, I leave the bags on for 60-90 minutes. This keeps the breast chilled while the dark meat comes to room temperature. As far as what type of bags, I use a large freezer pack slipped into a large gallon bag under the breast and a separate gallon bag for the neck portion of the breast. Happy Thanksgiving! I just wanted to let you know that I'm trying your dry brine method for turkey this year. I wrapped up the babies (I'm making two 11.5 lb birds) this morning. I'm guessing that since there will be two in the oven they will take a little longer then 1hr 20. What do you think? I hope you enjoy the recipe/technique. Can't so from experience on roasting two turkeys at once, but when I roast two chickens it does take a tad bit longer. Just use your thermometer and the birds should come out perfect. Happy Thanksgiving to you and your family as well!